The Pilatus PC-12 NG won’t just change the way you travel; it’ll change the trajectory of your life by opening up a world of experiences. One month, you’re flying your top executives to a remote landing strip in La Yegua, Mexico for a weekend retreat with Mexico’s most influential business leaders. The next, you’re preparing for a week-long family ski vacation in Whistler, Canada. You jump online and reserve your Pilatus PC-12 NG for the adventure. The massive cargo space and cabin are the perfect size for you, your wife, two adult kids, and their spouses! You select Conroe-North Houston Regional Airport for take-off to avoid the international airport traffic. 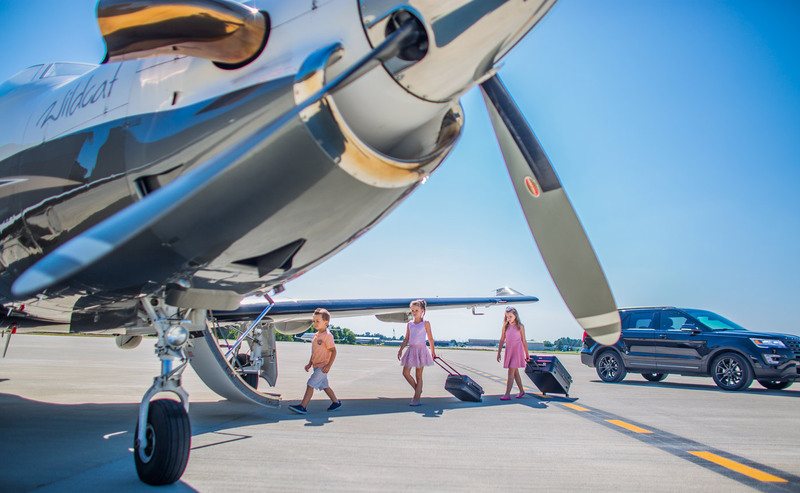 On the day of travel, a concierge limo service picks you up at your home and takes you directly to the airstrip, where your stunning PC-12 NG awaits with a full tank of gas and clearance for takeoff. You conveniently load the family’s ski equipment and suitcases into the large cargo hold and board the craft. 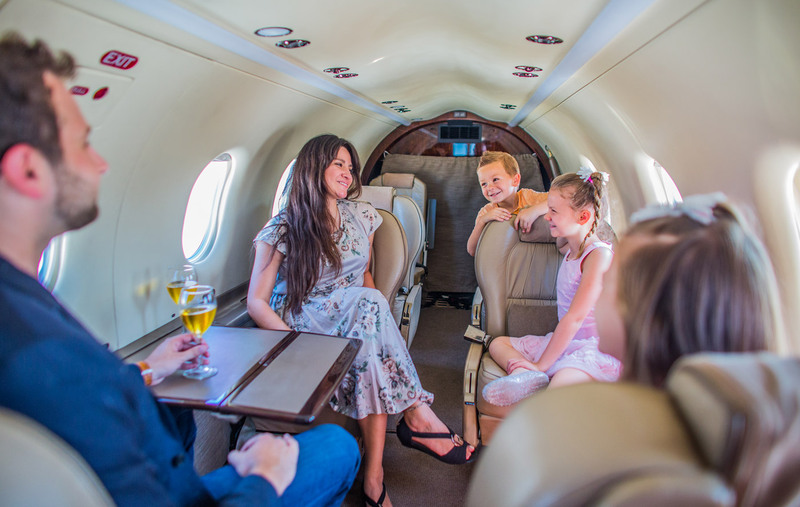 Within minutes, you and your family are in-flight, cozy, and excitedly talking about the adventure ahead. As imaginative as this scenario may sound, it’s the absolute reality for members of EvolveAir’s Shared Ownership Program. We exist to help others break free from the limitations of traditional travel. See the world first-hand with first-class luxury and style. You only get one life. Make the most of your memories and own every minute with the Pilatus PC-12 NG. The most revered turboprop in the world. The most iconic aircraft in history took one thing and made it better than anyone else. Pilatus challenged all things and created the world’s most impressive single-engine aircraft. The PC-12 took flight in 1991 and quickly become one of the most recognized turboprops ever invented. Over the years, Pilatus refused to settle for “the best” and relentlessly adapted the PC-12 to be faster, stronger, and more enduring. In 2008, they finally outdid themselves with the release of the Next Generation of business-class aviation. The PC-12 NG does not compromise speed and range for size and capacity, luxury for ruggedness, or power for versatility. To date, no other aircraft in its class can move as many passengers and equipment as far and as fast as the PC-12 NG. An aircraft this strong, powerful, and versatile quickly attracted attention. From air ambulance and executive transport to law enforcement and special government missions, the PC-12 NG earned a reputation for outstanding performance and is considered today to be the most popular turbine-powered aircraft in the world. The PC-12 NG is also one of the most exclusive aircraft to own. Pilatus minimizes the production and only makes two percent of the fleet available for purchase. 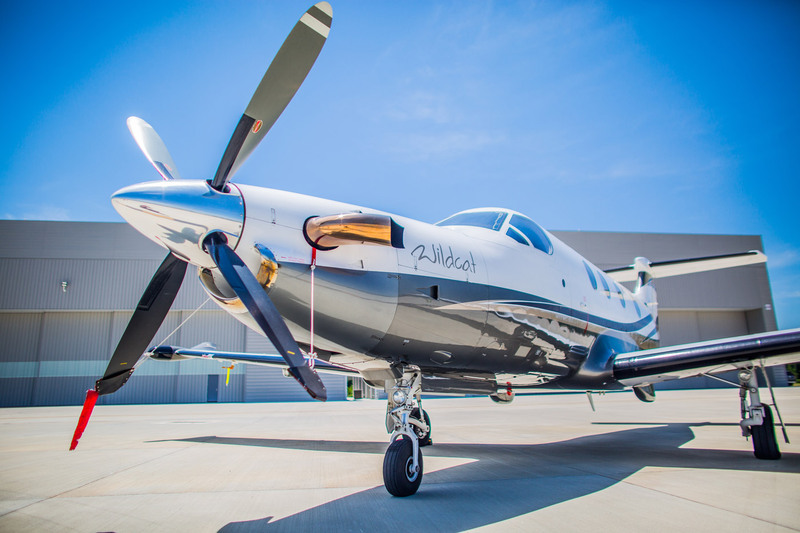 As such, the PC-12 NG is the least depreciating aircraft in existence and, with EvolveAir’s Shared Ownership Program, more attainable and affordable than ever. The strength and beauty of the Swiss Alps emulated in a single aircraft. Swiss engineers analyzed every square inch of the PC-12 NG’s exterior to reduce drag and increase the aerodynamics of the craft. As you approach the sleek carbon-fiber body and impressive 53-foot wingspan, you’ll immediately notice two unique details that give this aircraft an unmistakable presence on the runway. First, the craft’s posture is towering, with 2x the ground clearance of other aircraft. The additional clearance paired with large low-pressure tires and specialized wing flaps allow the craft to fly at very low speeds and land on unprepared runways in as short as 2,600 feet without damaging the fuselage. The second detail that will catch your gaze is the newly redesigned five-blade graphite composite propeller. Hartzell specifically engineered this prop for the PC-12 NG with thin blades to reduce cabin noise and increase the aircraft's climb and cruise rates without straining the engine. 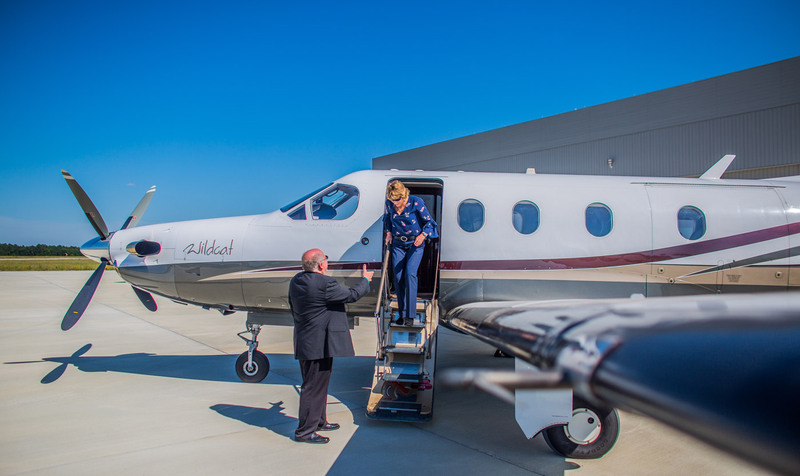 Walk to the side of the aircraft, and you’ll see a large cargo door that provides convenient access to the aircraft’s vast storage compartment, and a separate entry door that converts into a small 4-step staircase. Choose from several standard paint schemes, including Ferrari-inspired red, yellow and black, or your own customized exterior you create from a vibrant pallet of 40 different colors. This Airplane never ceases to amaze me. Whether it’s the performance on any particular day, the flexibility of suitable airfields (including unpaved airstrips), or the reliability of the airframe, the NG always delivers what we’ve grown to expect from the Pilatus. The world’s most versatile and desirable business-class aircraft. 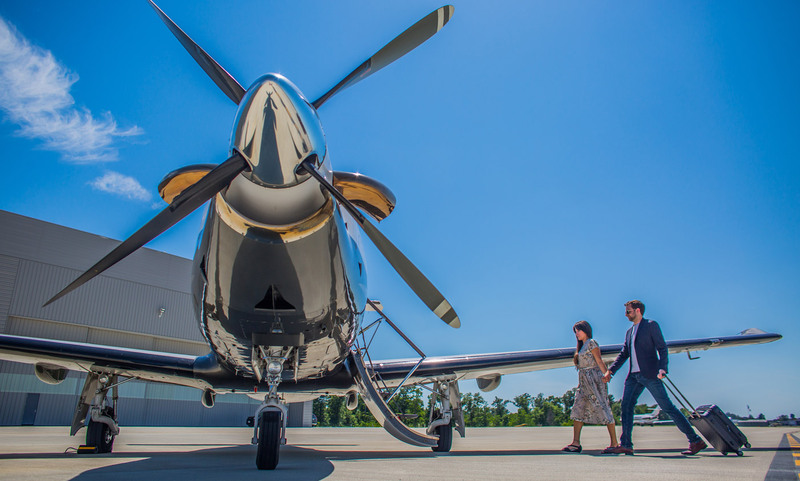 Arriving at your next important business meeting in the Pilatus PC-12 NG will make a powerful statement about your organization’s ability to go the distance. More than a power move, the Pilatus PC-12 NG provides indisputable business advantages that your CFO, in particular, will appreciate. As a shared owner, your business only invests in a fraction of the aircraft and may even be eligible for certain tax benefits. 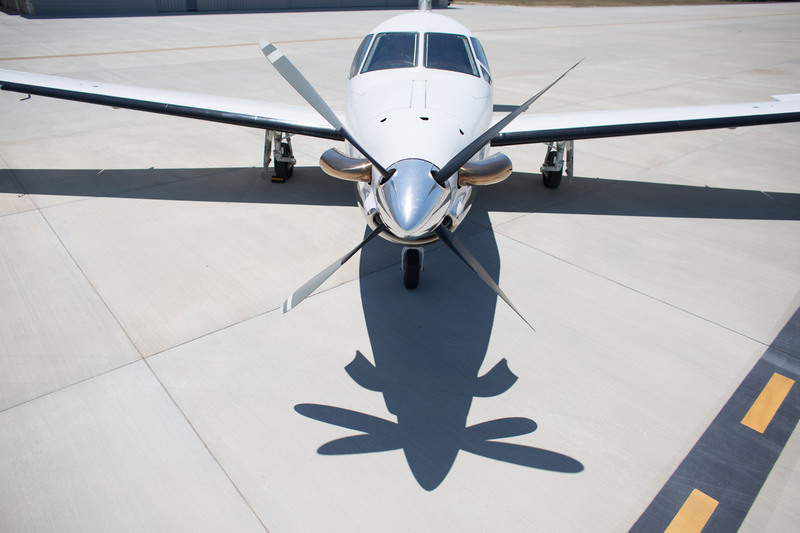 The PC-12 NG’s lightweight frame and single 1,200 horsepower PT6A turboprop engine reduces operational costs by 30-60% compared to other twin-engine jets and turboprops. Since the PC-12 NG is a limited production aircraft and a paragon of Swiss engineering excellence, the plane retains market value better than any other aircraft. Simply put, you won’t find a business aircraft with as much value for the investment as the PC-12 NG. 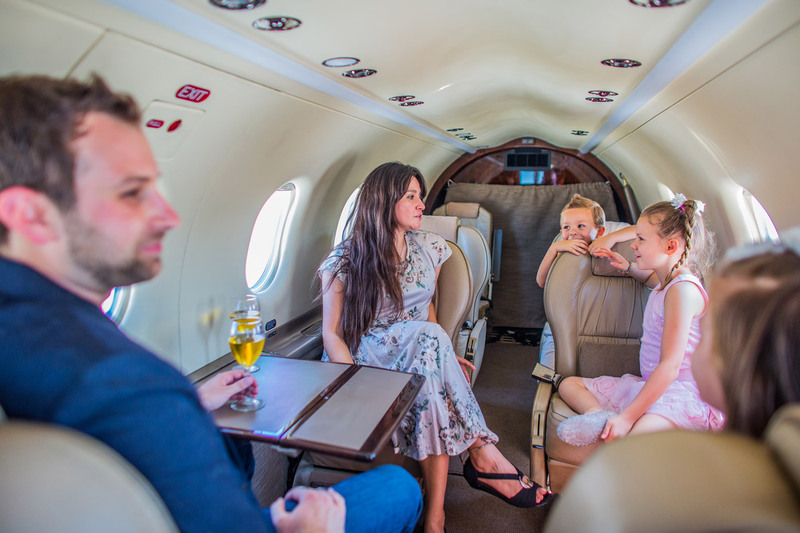 Your colleagues and clients will marvel at the large cabin, ample legroom, plush leather executive seating, and remarkably quiet atmosphere — perfect for pleasant conversation or shop talk while in transit. Fly to previously inaccessible locations and expand your business territory. Strengthen relationships with clients by doing more business in person. Make your presence known. The PC-12 NG will take you to the top. Fill the tanks, fill the seats, and fly over 1,000 nm non-stop. 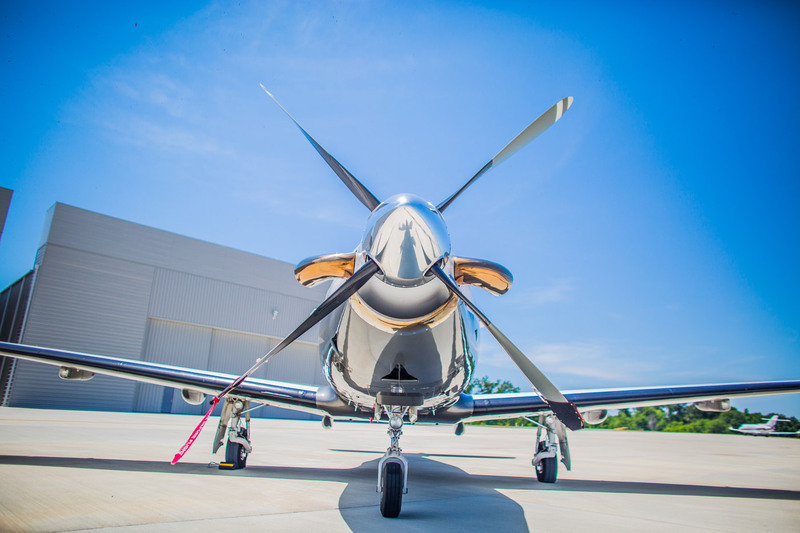 The Pilatus PC-12 NG isn’t just for business. Owning your own aircraft gives you the ability to adventure whenever you want, wherever you want! If weekend jaunts to New Orleans or spontaneous getaways to Guatemala sound like an impossible dream — think again. 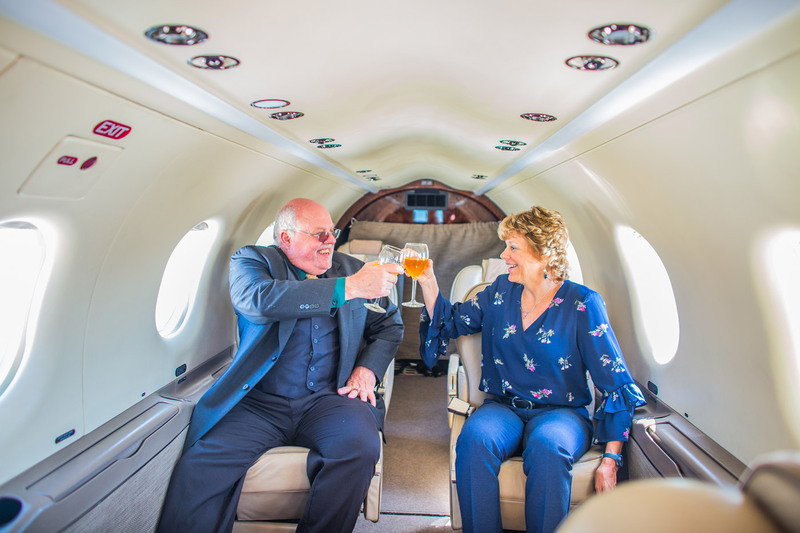 EvolveAir’s Shared Ownership Program makes private air travel a real possibility, and you don’t need to be a billionaire or an expert pilot to enjoy the perks! 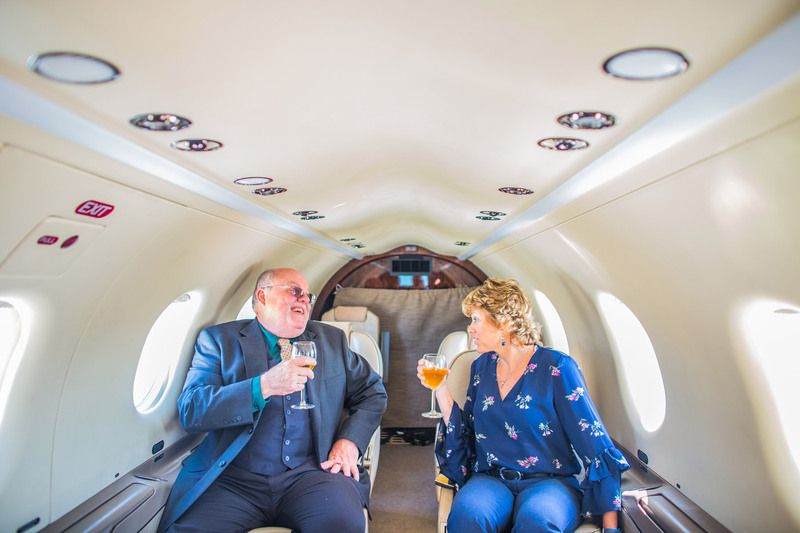 As a shared owner, you only pay for a quarter of the costs associated with owning and maintaining an aircraft while three other share owners cover the rest. 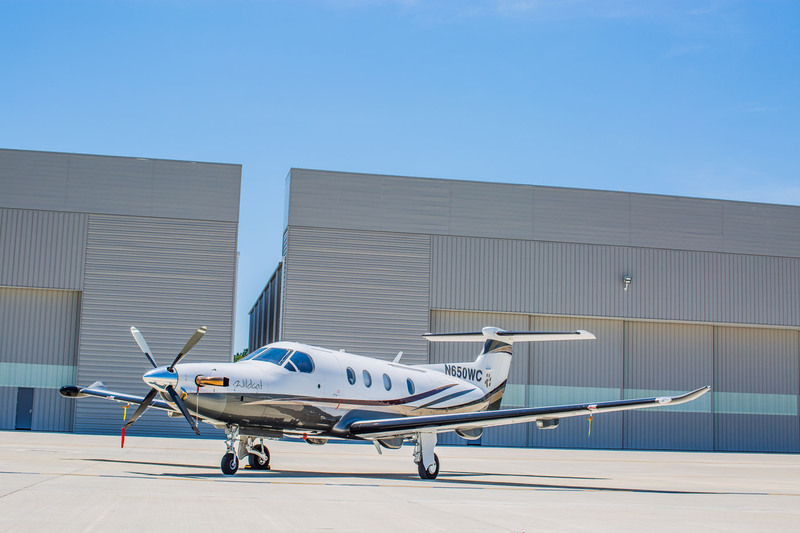 EvolveAir handles all the responsibility for you, including professional maintenance, flight planning, cleaning and caring for the aircraft, and dropping off or picking up your PC-12 NG at any airport in the Greater Houston area. How’s that for VIP treatment? 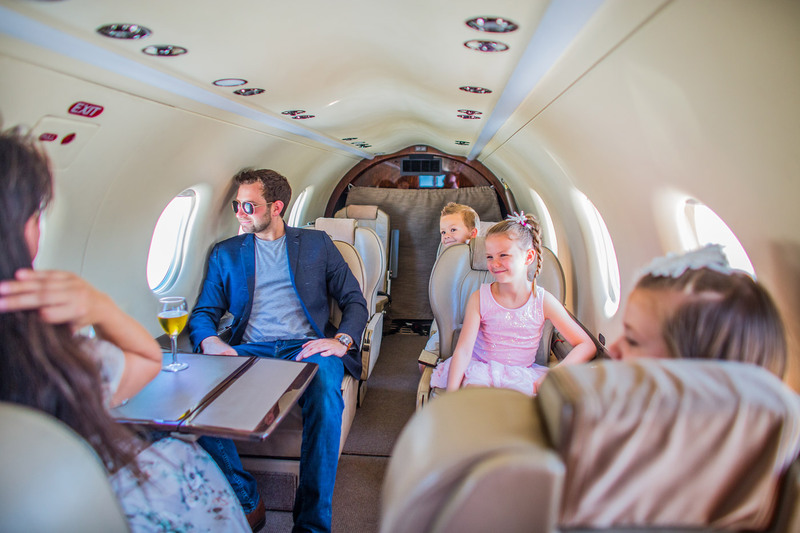 Fly your entire family to awe-inspiring new landscapes like the Cayman Islands or Jamaica. Take your friends on a quick overnight to Chicago for a Broadway show. With an outstanding safety record proven by over 5 million flight hours, your only worry is where to go next! Make the journey just as remarkable as the destination. Pilatus is known for their customer-focused engineering. Never is this more apparent than inside the luxurious PC-12 NG. Platus partnered with BMW Designworks to create an exquisitely crafted cabin that is both modern and elegant. Enter the cabin and make yourself comfortable in one of eight plush, custom-stitched leather seats. Stretch your legs, adjust the lumbar support, and recline or swivel to admire the rich rare-wood cabinetry. The PC-12 NG’s modular cabin layout allows you to reconfigure seating arrangements depending on the mission. Even with ten adults on board, this aircraft can travel up to 1280 nm. There’s no need for headsets to converse with other passengers. The PC-12 NG’s 5-blade prop and strategic engine placement put distance between the cabin and the aircraft’s turbo-power, making the in-flight experience quiet and relaxing. Not a light packer? 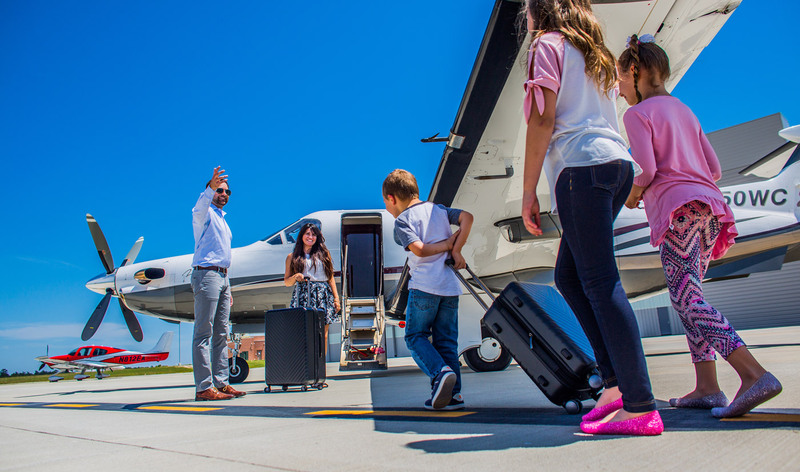 With 40 cubic feet of baggage storage (up to 400lbs) and twice the cabin space of a personal jet, a roomy travel experience is guaranteed. From ski equipment and bicycles to luggage and golf clubs, there’s no need to leave bulky possessions behind. For long distance travel, passengers will appreciate the luxury of a discreet yet spacious lavatory that offers complete privacy. Flat flooring runs the entire length of the aircraft to make standing and walking in-air more convenient. Direct cabin access to the aircraft’s luggage compartment adds a final touch to the practicality of the PC-12 NG’s interior design. Most impressive is the alluring cockpit, equipped with the advanced avionics of a high-end business jet while being tailored for a single pilot. Two PDF screens and mounted multifunctional displays set the stage for this Honeywell Primus ApexTM integrated avionics suite, which features SmartViewTM synthetic vision with performance-based HUD symbology. Automated settings and easy-to-access controls make the PC-12 NG an incredibly safe and intuitive aircraft to fly solo or with a co-pilot. Travel farther, faster, in more comfort, on less fuel. Relaxation meets ruggedness with the Pilatus PC-12 NG, hence its nickname, the ultimate aerial SUV. 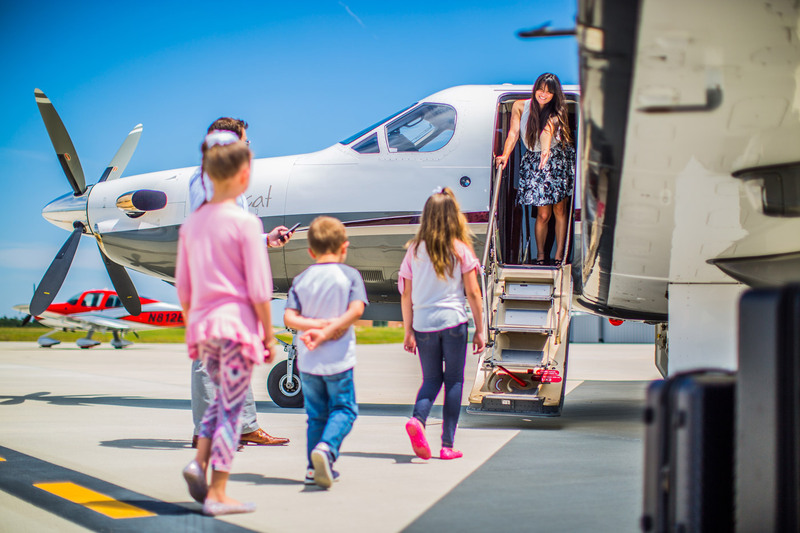 As passengers settle into the comfort and luxury of the PC-12 NG’s spacious, well-appointed cabin, the aircrafts low-pressure tires, 5-blade propeller, and Pratt & Whitney PT6A turboprop engine create an unparalleled flight experience that literally opens up a world of destinations. The PC-12 NG can take off and land in only 2,600 feet — nearly 900 feet less than other aircraft — on practically any surface. Even with 10 passengers and a pilot, the PC-12 NG will land lightly on grass, gravel, snow, dirt, and other unpaved runways, making 84% of the world’s airfields — including 21,300 remote runways — yours to explore. Climb at the incredible rate of 1,920 feet per minute. Cruise 30,000 feet above sea level at the blazing speed of 328 mph. Travel over 2,100 miles in the utmost safety and comfort. The world is your new backyard. Legendary stories arise from extraordinary adventures. What will your next story be?